This planter is EXCLUSIVE to us! Perfect for a whole host of planting, from bedding and bulbs, to small shrubs and standard trees. Dress up your displays but at a fraction of the cost of expensive metal and ceramic pots found in most garden centres. Made from heavy duty polypropylene that is both UV stable and weather resistant, with drainage holes already added. 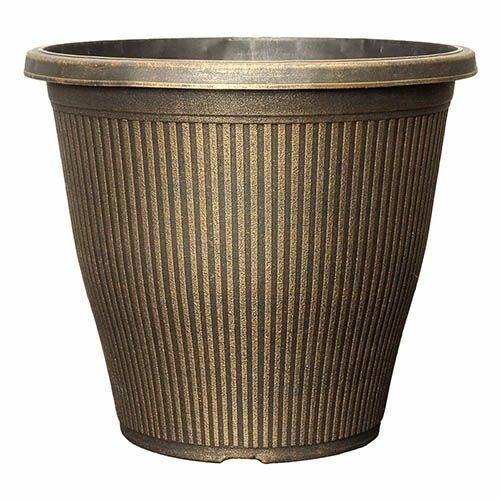 Supplied as a single 30cm (12in) diameter black/bronze coloured planter. A simple way to really show off wonderful floral displays, this classic garden planters with a contemporary finish brings an elegant touch to any garden. Perfect for a whole host of planting, from bedding and bulbs, to small shrubs and standard trees, this planter will dress up your displays but at a fraction of the cost of expensive metal and ceramic pots found in most garden centres. This pot is made from heavy duty plastic that is both UV stable and weather resistant so it won’t fade or tire come rain or shine. You can reuse year after year with the sample spectacular look. Perfect by doorways, gateways or lining pathways, this pot has been finished in a beautiful metallic bronze paint, adding a touch of grandeur to your home and garden. Supplied as a single pot made from a durable UV-stable and frost-resistant plastic, and hand painted with a black bronze metallic finish.